Pryce Jones was born on October 16th 1834 in Newtown, Montgomeryshire. He apprenticed to a local draper, John Davies, and took over the business in 1856. In the same year he married Eleanor Rowley Morris of Newtown. The business, renamed the Royal Welsh Warehouse, flourished. In an attempt to sell his goods to as many people as possible he developed the idea of sending patterns of merchandise to local gentry, which then led on to him sending out lists of available merchandise from his own and other factories much further afield, eventually advertising abroad. One of his products was the patented Euklisia Rug - an all-in-one rug, shawl, blanket and pillow. This was used extensively by German troops during the Franco-Prussian War of 1870-1 and later became known as a sleeping bag. Large new premises were built in Newtown in 1878 to house the expanding business and it was opened with much pomp and ceremony on 3rd October 1879. In 1882, while Pryce Jones was campaigning to become Conservative MP for the Montgomery Boroughs, he met the Post Master General and suggested the idea of developing a parcel post to him. A letter post already existed but parcels had to be sent by road and rail carriers, sometimes at great expense - obviously an important consideration for a mail order business. The Post Master General took up his idea and the Parcel Post was developed as a result. Pryce Jones did become an MP from 1885-6, and during 1892. He became High Sheriff for Montgomeryshire in 1891. For his services to commerce, he was given a knighthood in 1887 and changed his name to Sir Pryce Pryce-Jones. He also paid for the construction of All Saints Church in Newtown at a cost of £3000. 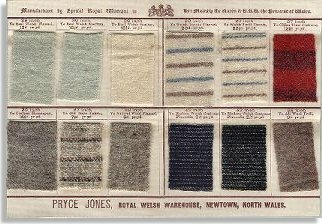 The Royal Welsh Warehouse had in the meantime acquired its own printing press and in 1890 produced its first illustrated catalogue to replace the simple price lists that had been sent out previously. The family lived at Dolerw, a large house on the North side of the river in Newtown. As Sir Pryce became increasingly involved in local politics although his experiences weren't always happy ones in this respect. His involvement in company business gradually diminished, and as his health began to fail his son Edward took control of the company in 1906. Pryce died on 11th January 1920, his son Edward in 1926. However, the Pryce-Jones family continued to be involved in the running of the company until 1938 when it was taken over by Lewis' of Liverpool. His grandson Sir Pryce Victor Pryce-Jones and his wife moved to Norfolk. He died in 1963; she died in 2000. 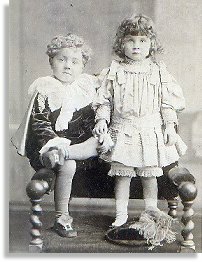 For more genealogical information on the Pryce-Jones', visit Recyclegen.com.